Bred to be grown as a small columnar apple tree, Starline ‘Greenfinch’ is extremely versatile and heavy cropping. It can be grown in a patio pot or planted in a small garden, but if you have more space then you could plant it in rows to create your own mini orchard! The large, tasty green apples have a slightly acidic flavour and are ready for picking in September and October. Beneath the bright green skin of these dessert apples, the flesh is firm and crisp and we’re sure they will prove popular. A modern variety of compact apple tree, 'Greenfinch' is self-fertile and benefits from having excellent disease-resistance. 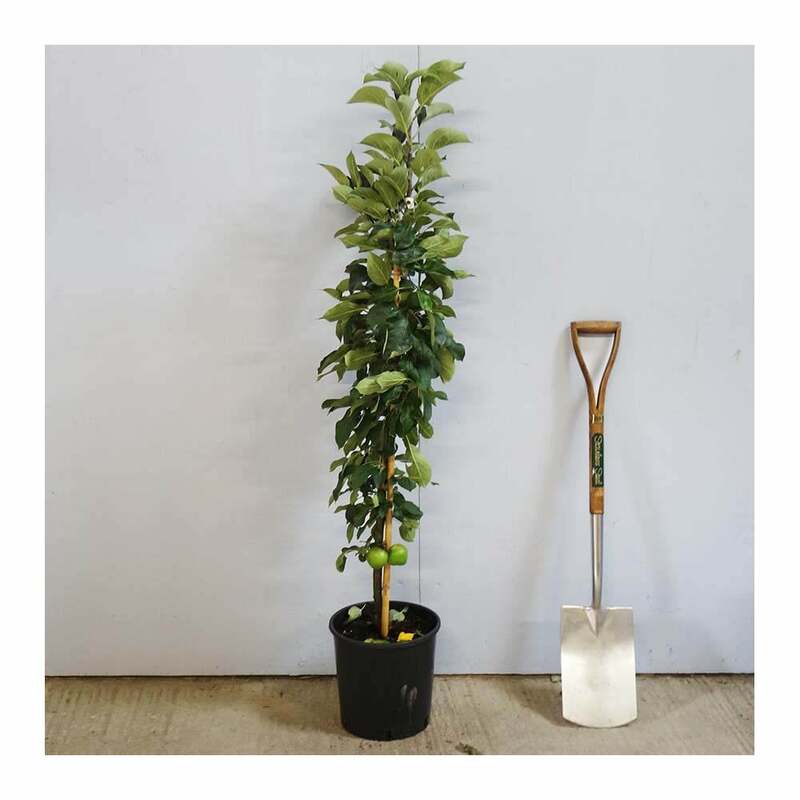 Greenfinch patio apple trees don't require a pollinator, so only one tree is required, but if do wish to plant several then they can be planted just 60cm apart. Our pot grown cordon apple trees can be planted at any time of the year, whereas bare root ones can only be planted between November and March. If you’re planting Greenfinch in spring or summer, water well and regularly for the first few months. If you’re planting in autumn, you may only need to water a little. Keep an eye on young fruit trees and increase watering if there are periods of hot or dry weather. Keep the area free of competing weeds and grass for the first few growing seasons. The guide linked to above provides further advice. Our Greenfinch cordon apple trees will already have a central leader. Simply prune to maintain the shape of the tree if required and remove any diseased or damaged branches. Carry this out between November and March.